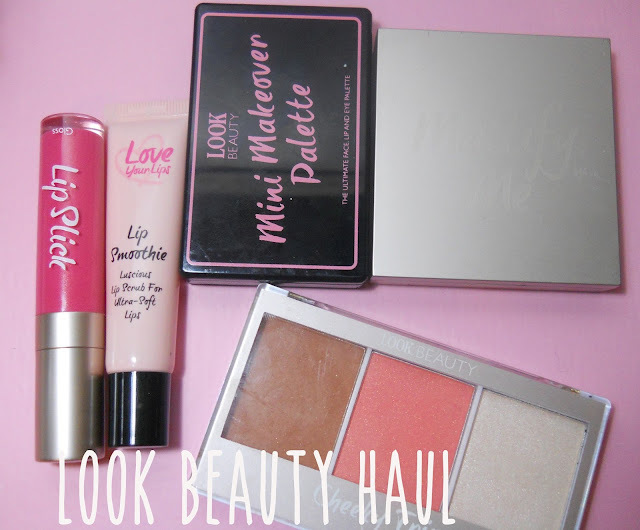 Blogable Beauty: Look beauty haul! Lips slick in raspberry, lip smoothie, mini makeover in rock chick, mattify powder and cheeky trio in melba. to be honest, the main thing that drove me to really buying was the packaging of the products, they are sooooo cute!. Lips slick: Its a creamy and very pigmented lip gloss, love the shade, it's like a fuchsia pink with a hint of dark berry color. Lip smoothie: lip scrub gel, smells like mint and leaves your lips super soft. Mini makeover palette in Rock Chick: this palette has 8 eyeshadows, six shimmery and 2 matte (the last one on the first line, and the first one on the second line) four lip colors and a blush all matte. Mattify me powder: Lovely powder, I've been using it every day to set my concealer and I love it! side note: mine fell on the ground and it didn't break one beat, also it has a huge mirror inside. Cheeky trio in Melba: a bronzer, blusher and highlighter trio, the bronzer is matte and a bit powdery, and the blusher and highlighter are shimmery. I'm really happy with my first "Look Beauty" experience, have you tried any of this products? what's your favourite? Love your products, your shades are nice ! your blog is just too cute! will be following it for sure, cant wait for the new post! that cheek trio looks so pretty! i've never got anything from look before but maybe ill check it out!